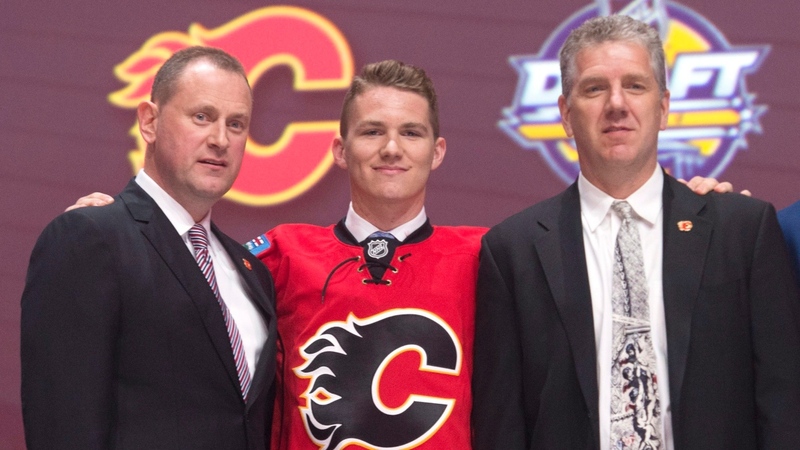 Fans in Calgary have to be ecstatic with how the 2016 draft turned out for the Flames. Matthew Tkachuk looks like he can be a bonafide star in the league – if he ever decides to play with a little discipline – Tyler Parsons looks like he could turn out to be the best goalie from the draft and both Adam Fox and Dillion Dube are looking like steals where they were selected. Thanks to a much improved season, there will be no top-10 pick this year. The Flames will be selecting 16th and will be looking to take advantage of a draft class that is incredibly jumbled everywhere after the first two pick. It will be important for the Flams to do well in the first because as it sits right now, they do not own a second or 3rd rounder. With that in mind, let’s take a look at a few options for the Flames with each of their picks this season. Lias Andersson is a two-way center that is a tremendous skater and can be relied upon to fill just about any roll a coach asks of him. He is a smart player that seems to understand the game at an advanced level. He can play any forward position – though he’s strongest down the middle and will likely settle in as a center in the NHL. His offensive numbers don’t jump out at you, but that’s a by-product of playing a season and a half in the SHL already. He’s a tenacious forechecker that uses his speed to get in on opponents quickly, and the grit to disrupt the play and cause turnovers. It may sound like Andersson is more of a grinding center that you wouldn’t want to take this early and while he can play that style of game, he also has the speed and hands to be a very dangerous possession player. He’s one of the older players in the draft and given that he’s used to playing in senior leagues in Sweden, Andersson might be one on one of the quickest tracks to the NHL of anyone in this draft class. It wouldn’t be surprising if he spent one year in the AHL before making the jump right to the NHL to make an impact before his 20th birthday. Inamoto is a big-bodied defenseman that plays a tough game and shows the kind of fight and tenacity that coaches like to see from a shut-down defender. If he were more disciplined with his physical play, you’d likely see Inamoto get more opportunities with the US team – and likely see him a lot higher on many draft lists. He’s got a projectable NHL skill set and definitely worth a flier at 109. Here is a more in-depth look at Tyler Inamoto. Joly is a big winger that has a great stride and skates with a lot of power. He plays a very physical game and does his best work down low and against the boards. His number in the QMJHL this season are not very impressive at first glance, but when you take a deeper look (as is one in this scouting report) you see he is a very strong offensive producer. A swing for the fences pick, Andonovski is going to be a long-term project for whoever drafts him. Playing high school hockey this season, he’s scheduled to go out to the BCHL to play for Chilliwack next year with an eventual stop at Princeton for the 2018-19 season. That could all change if the team that drafts him decides he’s got a legitimate shot at the NHL and junior hockey is the best course of action – the Ottawa 67s own his CHL rights. He’s a good skater that has tremendous skills with the puck – we’re just going to have to see if he can do it all while facing higher competition. Once you get into the 200s at the NHL draft, selections begin to look tailored towards biases. One thing you often see is teams selecting kids they’ve watched play more often – since it’s a total crapshoot anyway. Playing in Calgary this season, you’d assume the Flames front office were able to see Grishakov play a lot this year, become comfortable with him as a player and gain a familiarity. He is a talented forward that took a lot of time to adjust to his first season in North America. The Flames could do a lot worse at 202 overall. Previous 2017 NHL Entry Draft: Who Could Vegas Select with Each of Their Picks? Next 2017 NHL Entry Draft: Who Could the New York Rangers Select With Each Pick?